For developers looking to make an investment with a high return, they usually target the high-end market. When you’re targeting a high-end market that means that you’ll need to have a higher amount of capital to invest with. Laminate flooring will not get you a million dollar home these days. If you expect to cater to high-end buyers, you’re going to need to invest in high-end building materials. It can be said that marble is synonymous with luxury, and high-end buyers who spend a generous amount of money on extravagant real estate expect that property mirror the cost. While setting a good foundation, using the best materials to wire electricity through a build and incorporating top-notch pipes for plumbing may go unappreciated, the more obvious building materials like marble won’t. Why Use Marble for a Build? Marble is a type of natural stone that demands admiration. It has been known to stand the test of time in historic architectures and artwork. It is the material that has been associated with the well-off, people who possessed the luxuries of life. It is no wonder buyers are willing to pay a premium price for such builds. However, how marble is associated with wealth isn’t the only reason why this natural stone is so highly coveted. Marble is just a practical building tool. It’s solid, it doesn’t scratch, tear, or bend, and is pretty much unbreakable, which means that it’s will never need to be replaced. That is a huge benefit for anyone buying real estate, especially for luxury homes. The less a homeowner or landlord has to repair, the more money he or she can save overall. The cost of maintaining real estate can be quite pricey, even if you are buying a new dwelling. If you are investing in a new shopping mall, you’ll need to maintain the marble floors that shoppers traffic on. That’s one of the drawbacks to installing marble floors into a luxury build. On the other hand, you should think of what your other alternatives might be when it comes to trying to put out a certain type of build that appeals to luxury buyers. Overall, nothing can top natural stone, but marble is typically the top choice for builders who want to achieve a grand look. Why is Marble So Great? Marble is a metamorphic stone that is originally formed from limestone deep within the earth that reorganizes itself with other minerals and organic material when subjected to intense amount of heat and pressure. This metamorphic process creates a denser stone with different variations of color and veining. These colors are organic, created from natural minerals. Therefore, the color patterns in marble tend to go with almost any design choice. Here, it’s usually a matter of preference. Marble tiling comes in so many color variations, that it might be difficult for builders and contractors to select the one that will appeal to a large customer base in the high-end market. If you are building for a specific contract, then you’ll have the freedom to go a little bolder with color choices as it will be the buyer’s preference. But if you are building a lot of luxury homes, they need to have some sort of neutral design so that the buyers or renters can put their own design print in the space. On the other hand, if you are looking to stand out above your competition, then you might want to incorporate something that pops out from the regular neutral interior designs. Something strong like Emperador Brown Dark Marble or Pietra Gris Montana would serve as a great backdrop for a decorative logo. It can also make an eye-catching accent wall, as well as bold bordering. 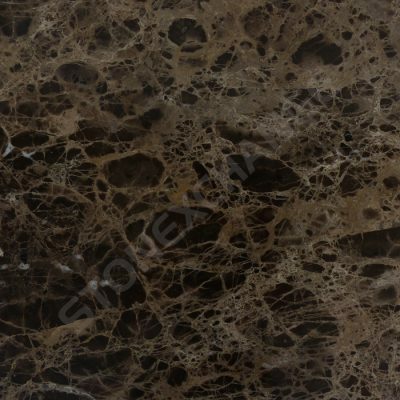 The Emperador Brown Dark Marble Tile also goes by name of Marron Emperador or Brown Imperial. It has a straight edged polished finish and is imported directly from Spain. Nalboor Tiles, a natural stone wholesale tile distributor in Miami, Florida, offers this tile in two sizes: 12” x 12” x 3/8” starting from $6.95 a square foot and 18” x 18” x 3/8” starting from $7.95 a square foot. The Pietra Gris Montana is a bit more exotic with its dark grey, black, and even hints of red veining in this tile pattern. The ivory veining breaks up the dark coloring creating a movement of a slate grey flow throughout the tile while maintaining it’s predominately black color. Nalboor offers this tile in two different sizes of 12” x 12” x ½” and 24” x 24” x ¾” both at $6.95 a square foot. Another charming marble tile that is guaranteed to captivate the attention of luxury buyers is the Statuario Venato Marble Tile. This is probably the boldest type of marble tile that can be accepted into the neutral category because of it’s bright, white color. The outstanding feature about Statuario Venato is its striking grey veining. It is a polished straight edge natural stone that is imported from Italy and comes in two sizes: 12″ x 12″ x 3/8″ at $9.95 a square foot and 18″ x 18″ x 3/8″ starting from $16.95 a square foot. Nalboor Tile has a wide selection of natural luxury tiles that you can choose from. We also offer tumbled tiles, porcelain tiles, and engineered stone. To learn about the differences between these products, ask our customer service representatives at 1-305-501-4549 or as us a question online through our contact form here. We look forward to hearing from you soon!